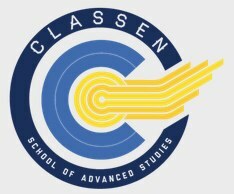 Thanks to the hard work of volunteers on our merchandise and communications committees, official ClassenSAS shirts are now available for online ordering! We are currently offering four designs in four colors (blue, black, white and heather) and five styles (short sleeve Ts, long sleeve Ts, sweatshirts, hoodies & zip hoodies). These are pre-order, so we will be placing an order in August and then plan to place another order in October. Please plan on 2-to-3 weeks for your shirts to be available for pickup at the school. Orders can be placed with a credit/debit card by clicking here. (Be sure to use a laptop or desktop computer, we’ve had reports of the order form not working on tablet computers.) Forms are also be available for cash and check orders in the office. You can see pricing and designs on the online website store. For quick future reference, we’ve added an ONLINE STORE link to the top of our website, which you can also use to submit apparel pre-orders. Also remember this recent rule change: The shirts in uniform colors (blue, black or white) can be worn ANY day of the week. Thank you to Classen Administration for allowing this!